Recent reports that cancer rates in UK women are set to rise six times faster than in men over the next two decades will have alarmed many. It is likely to be a similar story across the western world. In the US, cancer rates have been steadily decreasing in men but not in women . 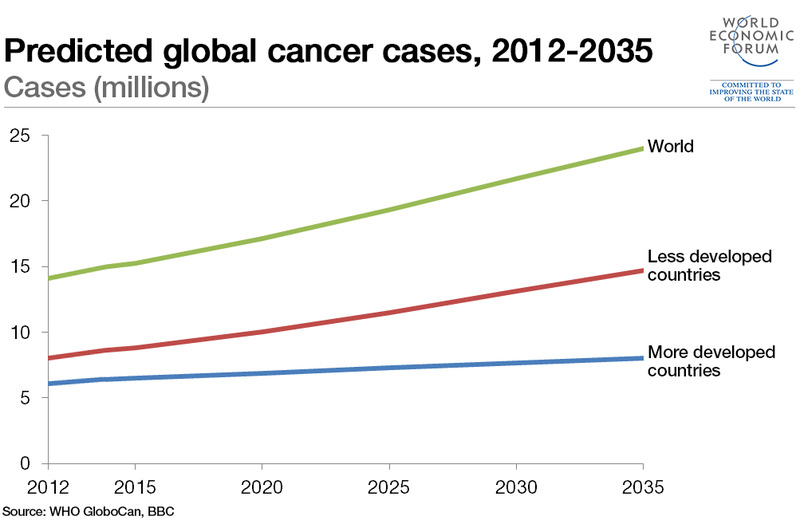 And although it is still the case that more men than women get cancer, the gap is narrowing. The new prediction of future trends for cancer in women by Cancer Research UK is based on our knowledge of how lifestyle choices and other factors can affect your chance of getting cancer. The World Health Organisation has estimated that two fifths of the 14m cases of cancer that are diagnosed every year are preventable . The main preventable causes of cancer are diet, smoking and infection. Of these, diet is likely to most disproportionately affect women over the coming years. It has been estimated that over half a million cancers worldwide can be directly linked to obesity and inactivity every year. Although being overweight can increase the risk of some cancers that affect both sexes, such as kidney cancer and bowel cancer, some cancers that only affect women are also strongly linked to obesity. However, no similar causal link has been made between obesity and cancers that only men get – although there is evidence that prostate cancer can be more aggressive in overweight men. This can partly explain why cancer rates are increasing faster in women than in men. In particular, studies have shown that cancer of the breast and of the womb are more likely in women who have a high body mass index (BMI). Rising levels of obesity have been followed by a rapid increase in the number of these cancers diagnosed. For example, the number of cases of womb cancer diagnosed every year in the UK has almost doubled since the early 1990s and it has been estimated that a third of all womb cancers can be linked to obesity . The way that being overweight drives these particular types of cancers is complicated but one of the main factors seems to be the production of the hormone oestrogen by fat cells in the body. Most breast and womb cancers produce a protein called the oestrogen receptor that causes cancer cells to uncontrollably divide when oestrogen is present in high amounts. All adults have a certain amount of oestrogen in their bodies but for women who have been through the menopause in particular the amount of oestrogen is largely determined by how much fat they have in their bodies. Studies have consistently shown that breast cancer is both more common and less readily treatable in overweight women. Risk of breast cancer is also increased by alcohol – the more you drink, the more likely you are to get the disease. A study published last year showed that across the world women are now drinking almost as much as men. This is worrying because alcohol is also strongly linked to other cancers, including cancers of the mouth and upper throat. At the moment, more men than women are affected by these types of cancers but with women drinking more it is likely that they will become more at risk. Smoking is another major cause of preventable cancer in women. In the UK, lung cancer is now the second most common cancer in both men and women. In the past, lung cancer was much less common in women than it was in men – thanks in large part to women smoking less. However, from the mid-20th century onwards, increasing numbers of women took up smoking, even as it became less popular among men. So, while the trend in recent years has been for lung cancer to become less common in men, it has become more common in women. The good news is that fewer people are smoking every year and so lung cancer rates in both sexes will decrease. However, as it can take 20 years or longer for lung cancers to develop, it will be some time before we see the effect on the number of people who are affected. There may also be good news on the cervical cancer front. Each year sees the diagnosis of around 3,000 new cases of cervical cancer in the UK alone and almost uniquely among cancers, these can be linked to a single cause – infection with human papilloma virus (HPV). However, rates have decreased since the 1970s due to the cervical cancer screening programme which often catches the disease before it progresses to full-blown cancer. In many countries, including the UK, girls are now routinely vaccinated against the commonest of the most harmful forms of the cancer-causing virus. There is already substantial evidence to show that this is having an effect on both rates of infection and the early stages of cancer, and it is to be hoped that the future will see rates of cervical cancer decrease dramatically. However, we should not forget that in countries without screening and vaccination programmes, cervical cancer remains a major killer of young women , with a quarter of a million women dying from the disease every year. Lessons can be learned from both lung and cervical cancer, as they show how both education and intervention can help to decrease the number of cancers that are diagnosed. The question is: can something similar be done for obesity-related cancers? Obesity rates in the UK and beyond have continued to soar despite healthy eating messages – suggesting it may be a far tougher nut to crack. Attempts at changing attitudes towards alcohol have so far met with a similar lack of success. Cancer is currently more common in men than women, but due to changes in lifestyle women are catching up fast. It’s clear that unless progress is made in tackling obesity and other preventable causes of cancer, more people of both sexes will be diagnosed with the disease every year. We can all take the initiative in reducing our chance of getting cancer by eating more healthily, drinking less and doing more exercise.